"(h)Auroræ has an air of being McCaughry’s magnum opus, the sum result, from an aesthetic perspective, of all that he has done previously with his Anathema Publishing imprint. It’s gorgeously presented, intricately designed, with a poetic quality that is enigmatic and just a little bit impenetrable. At 304 pages and 5.25 x 8.5 inches dimensions, it feels substantial and weighty, the right size, texture and weight to convey a sense of significance and substance, fitting in your hands like a treasured tome, without being cumbersome. This aligns with statements McCaughry has made elsewhere, where he has talked of the magick inherent in books, and the profundity inherent in writing, producing and reading them. (h)Auroræ is divided into three main sections or books, the first of which reprises the (h)Aurorætitle and is itself comprised of five codices; plus a long, circumlocutory introduction from Shani Oates. Each codex consists of short stanzas of poetry, formatted in a fairly large italic face and almost always accompanied with an illustration on the respective facing page. McCaughry’s style of verse is, one could charitably say, brisk, sometimes running to as little as four lines, with an economy of words that nevertheless draws from a clearly defined lexicon. 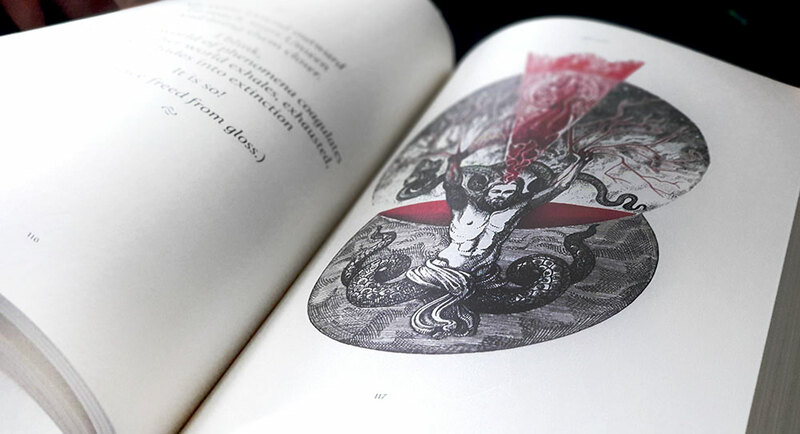 He declaims, rather than rhymes, using archaic turns of phrase and employing a wide array of imagery that references a variety of mythological and magickal sources, including Luciferianism, tantra, alchemy, theRuba’iyat and Mandaeism. This cornucopia of culture and its recherché language choices makes for a somewhat abstruse encounter, where you can get a sense of what is being said, but like alchemical texts of old, you’re never sure if you’re quite getting it all.